Nachi Waterfall is a landmark that complements the religious atmosphere which reignend for centuries in the Mountain, located within the Wakayama Prefecture in Japan. The beautiful flow among the rocks and with its thin and elongated water jet, Nachi Waterfall dominates an old Japanese shrine, which is among the three religious temples, built in Kumano. The feeling of an indissoluble harmony between nature and God near Nachi Waterfall is indescribable. Also known as Nachi-no-taki, Nachi Waterfall is one of the highest and one of the most beautiful waterfalls, which can be seen in Japan. It enjoys great popularity among the tourists, but the Japanese themselves consider it their great reverence. In the area of Nachi Waterfall there are other formations of other quite similar water attractions in the lower parts of the watercourse of the river, which are formed by Nachi. Some of them are waterfalls, Nino waterfall, Sanno waterfall and Onyo waterfall. Indeed, Nachi is used to aggregate the name of all 48 waterfalls that are formed in the mountainous highlands. In particular, today called, Nachi Waterfall, was in fact formerly known as Ichino. 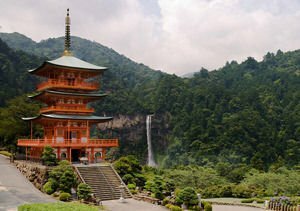 The waterfall is still a sacred place of worship since ancient times.Immediately after the parking lot of the Nachi Waterfall, where you can leave your car, starts the religious complex, where you can see the sanctuary Hiro. This beautiful area seemed very different from the entire province of Honshu, which is located in Nachi. The entire mix of natural beauty, temples, pagoda and religious spirit, inspire a sense of special respect for a harmonious home. Nachi Waterfall reaches an altitude of 133 meters. There are two main places from which tourists can watch the beautiful water. The lower view is achievable from an ancient trail that passes through the temple of several rock formations. After them from the trees is a beautiful view of the bottom of the falling waters of the Nachi Waterfall. The top view of the natural phenomenon can actually be seen from inside the pagoda near the temple Sanseigantoji, which itself is also quite interesting to visit. From there you can take wonderful pictures of all kinds of the Nachi Falls. Access to both routes to see the beautiful waters falling of Hachi is obtainable with an entrance fee.